Modern day garages do more than just safeguard your vehicles from the elements. They are functional and recreational spaces that can be designed and renovated in any way you want. Being natural extensions of your home, garage doors are also important elements that affect your home’s overall aesthetics. It is no wonder then that homeowners are investing their dollars and time towards choosing the right garage doors for their style and utility needs. Here are some latest residential garage door trends that are fast becoming popular with homeowners. Enhancing curb appeal with striking garage door styles: Steel sectional doors have replaced slab-style doors of the past. People are going one step further to opt for sectional units with flush panel designs and full-view styles with windows. Windows allow natural light to seep in, and transform dark and gloomy garages into brighter and more appealing spaces during daytime. The emphasis is on contemporary and elegant lines, with most homeowners going the extra mile to complement the design of their garage doors to their homes’ architectural style. Garage door materials: While steel doors have dominated the market owing to their availability and price, the popularity of wood, vinyl and fiberglass has spiked. If you still feel that stain-grade wooden garage doors are the best option, you can consider looking at the latest fiberglass units that offer the wooden feel of traditional doors. They come with steel reinforcements and insulation linings, offering years of service. 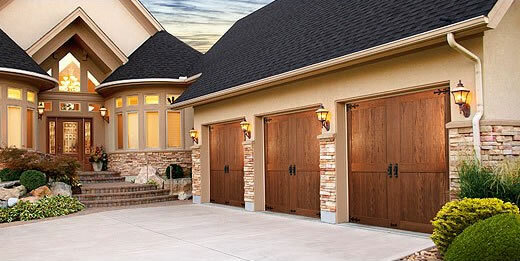 Insulated garage doors: An increasing number of homeowners are favoring insulated garage doors, and for good reason. They keep heat in during colder months and out during summers. Doors with high insulation or R.value offer energy savings, and can contribute to lower heating bills. Insulated garage doors also function as decent noise barriers. The good news is that there are many eye-catching insulated garage door designs to choose from. Safety features in garage doors: Here, safety is in the context of garage door operation. Homeowners are looking at doors that incorporate multiple safety features. This includes pinch-resistant doors that push your fingers away when they are placed very near to a closing door, and protect against injuries. Tamper-resistant bottom brackets, on the other hand, lower the risks of injury arising from door components under tension. Garage doors with polyurethane insulation offer greater fire safety by reducing the amount of flames and smoke generated. Explore your options, and zero in on a garage door style that perfectly matches your unique requirements.